The special issue on technology and health will feature articles related to the use of technology and health for Asian-Pacific Islanders. The title of this special issue, Asian / Pacific Island Technology and Health, welcome manuscripts from the United States, Asian and Pacific Island countries. Researchers, educators, graduate students, practitioners and administrators which report the health of Asian populations and health care approaches using technology are welcome. Studies on health of Asians, Pacific Islanders, and Asian-Americans with a goal on improving health and achieving equity. Studies of regionally or culturally determined primary care practices. Comparative or review of the state of lifestyle behaviors, common symptoms and their management. Methods, interventions, instrumentation, and educational techniques that are unique to this group. Theoretical foundations that increase understanding the unique response to changes in health and illness. Bio psychosocial, spiritual, and ecological impacts on practice, education, and research. Policy issues as a result of rigorous research outcomes. Complete information on how to prepare and submit articles and proposals may be found online. Asian / Pacific Island Nursing Journal: Official Journal of the Asian American / Pacific Islander Nurses Association has been accepted for inclusion in the Directory of Open Access Journals (DOAJ). The journal content is licensed under a Creative Commons Attribution-NonCommercial-NoDerivatives 4.0 International License. Asian / Pacific Island Nursing Journal: Official Journal of the Asian American / Pacific Islander Nurses Association features research papers, empirical and theoretical articles, editorials, abstracts of recent dissertations, and conference summaries that relate to nursing care written by scientists and researchers in nursing and the social sciences. © Stephen, Jesse W. (2005, July 28). The Traveling Moai [At Tongariki near Rano Raraku, Rapa Nui]. Article manuscripts are peer-reviewed, and should be 3000 to 9000 words in length. Reports, Reviews and commentaries are not peer-reviewed, and should be 1000 to 6000 words in length. Manuscripts should be submitted online. You may review journal policies and author guidelines on the journal submission site. Please send inquiries to the Rapa Nui Journal editor at (rapanuijournal@gmail.com). Subscribe to Rapa Nui Journal through UH Press or browse full-text issues online . Biography: An Interdisciplinary Quarterly seeks papers for an upcoming special issue tentatively titled, Biographic Mediation: The Uses of Disclosure in Bureaucracy and Politics. The issue will be guest edited by Ebony Coletu of Pennsylvania State University. While personal storytelling in public advocacy has long been a strategy for social movements, biographic mediation emphasizes the interactive dynamics between public disclosure and administrative decision-making. This issue addresses multi-level demands for biographic mediation in contests over public policy, employment, and educational access to explore how disclosure has the capacity to reshape identity or to refocus engagement with policy consequences. Contributors may consider how personal disclosure shapes public debates, when self-narrative is restructured according to political opportunity, and how telling the stories of others becomes a standard mode of political argument. Abstracts of 350-400 words are due by December 1, 2017 for consideration. Click here for the complete submission guidelines. Authors of manuscripts selected for publication may also be invited to present on their papers at the University of Hawai’i in August 2018. Subscribe to Biography through UH Press or browse full-text issues online via Project MUSE. The editorial board of Cross-Currents: East Asian History and Culture Review—a joint project of the Research Institute of Korean Studies (RIKS) at Korea University and the Institute of East Asian Studies (IEAS) at the University of California, Berkeley—is currently accepting submissions of research articles, as well as proposals for special issues and photo essays. Cross-Currents is a peer-reviewed, open-access, quarterly online and semi-annual print journal that offers its readers up-to-date research findings, emerging trends, and cutting-edge perspectives concerning East Asian history and culture from scholars in both English-speaking and Asian language-speaking academic communities. The journal seeks to balance issues traditionally addressed by Western humanities and social science journals with issues of immediate concern to scholars in China, Japan, Korea, and Vietnam. This English-language journal includes scholarship on material from the 16th century to the present day that has significant implications for current models of understanding East Asian history and culture. Embedded in a web-based platform with functions for collaboration, discussion, and an innovative publishing process, the e-journal uses new technologies to facilitate a dialogue among East Asia scholars around the world that is enhanced by audio-visual and multilingual capabilities. The semi-annual print issues of Cross-Currents (available through University of Hawai‘i Press and Project MUSE) feature research articles from the e-journal (the journal of record for indexing and citation purposes). Complete information on how to prepare and submit articles and proposals may be found online here. Cross-Currents is indexed in the Emerging Sources Citation Index (ESCI), Scopus, the Bibliography of Asian Studies, the Directory of Open Access Journals (DOAJ), and Project MUSE. The e-journal operates under a Creative Commons Attribution-NonCommerical-NoDerivs 3.0 United States License. Please email inquiries to the Managing Editor at crosscurrents@berkeley.edu. 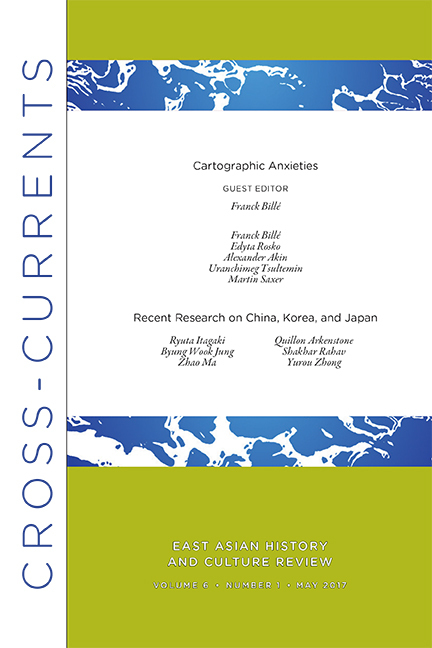 Cross-Currents: East Asian History and Culture Review offers its readers up-to-date research findings, emerging trends, and cutting-edge perspectives on material from the sixteenth century to the present day that have significant implications for current models of understanding East Asian history and culture. Its semiannual print issues feature peer-reviewed content from the online version of the journal. Individual and institutional subscriptions are available through UH Press. Palapala journal comes to us at a time when despite a growing number of speakers and academic work being produced in Hawaiian, there are few avenues through which scholars can share their research within a centralized, peer-reviewed archive dedicated to their language of study. Though Hawaiian is one of the most well-preserved indigenous languages in the world today, few outside of Hawaiʻi think to give it the scholarly attention it deserves, and there is still much archival information left for us to discover. It is our hope that Palapala will create a shift in this trend, and help bring Hawaiian and Hawaiian literature back to the forefront of scholarship, particularly in Hawaiʻi schools, but also throughout the academic world. Those eager to study Hawaiian language and culture should have more access to academically-credible, peer-reviewed works, which Palapala hopes to produce and provide for the community of scholars interested in na mea Hawaiʻi. It is our ambition that with this journal, we can continue to expand our knowledge of ancestral Hawaiʻi, and share that ʻike with the global community. New research on Hawaiian language and literature. Book reviews on significant new books as well as books that have been widely used as references for people working in Hawaiian. Important reprints of newspaper and journal articles that continue to be important for new research, whether from the Hawaiian language newspapers or from other sources that are now difficult to access. Palapala prints articles in Hawaiian, English, and, if we can find peer reviewers, other languages. Anyone interested in contributing as an author or peer-reviewer may address an email to the editors at palapala@hawaii.edu. Please note that the annual deadline for submissions is September 1. In honor of the many kupuna who strove to preserve Hawaiian language during its time of adversary, we look forward to embarking on this important voyage towards a better future for ʻŌlelo Hawaiʻi. Submission guidelines: Submissions (research articles and reviews) must be original works not scheduled for publication by another publisher or original work for which the contributor has received all necessary permissions to republish as open access. Reprints of important articles may also be submitted. Please send proposals or full-length articles for consideration to the editors at palapala@hawaii.edu. Manuscripts must be provided in Word doc format with all images and tables extracted as separate files. Please format all manuscript notes as endnotes and refer to the 16th edition of The Chicago Manual of Style for citations and style guidelines. Please see the University of Hawai‘i Press Manuscript Guidelines for more details. Upon acceptance, contributors will be asked to sign a publication agreement with University of Hawai‘i Press, and all content in Palapala is published under a Creative Commons Attribution-NonCommercial-NoDerivatives 4.0 International License. Biography: An Interdisciplinary Quarterly seeks papers for an upcoming special issue tentatively titled, Political Biographies in Literature and Cinema. To what extent do biographies promote or question the biographee’s political values? What are the limitations of prevailing assumptions (popular and/or academic) about biography’s relationship with history? What models of the political subject do biographies of political figures presuppose, and with what consequences? 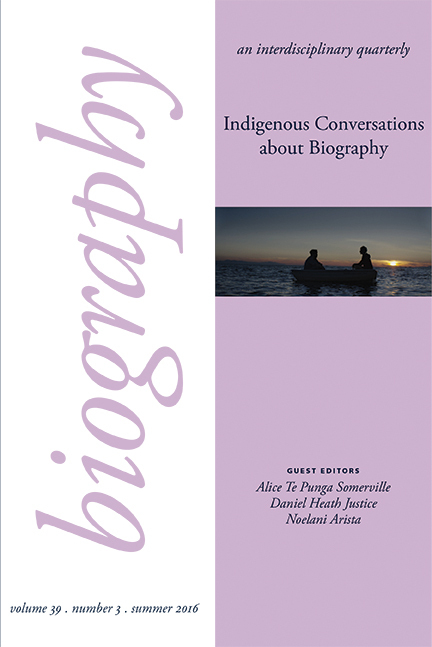 Articles of general relevance, as well as specific case studies of print or film biographies, are welcome in this special number of Biography, An Interdisciplinary Quarterly on political biographies in literature and cinema. Abstracts of 250-500 words for projected manuscripts of 6,000-8,000 words may be submitted electronically by April 15, 2017. Click here for complete submission guidelines. 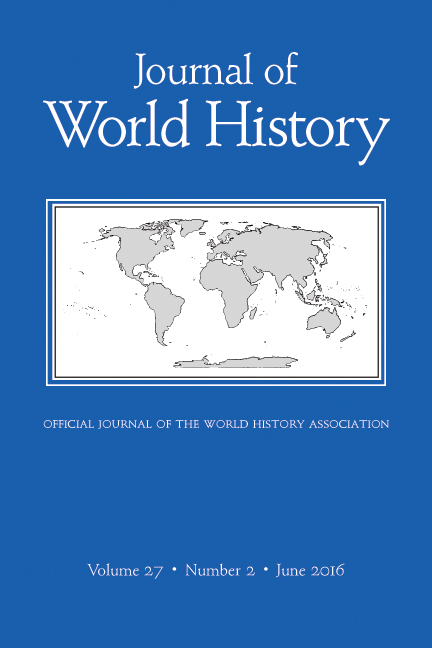 The Journal of World History publishes research into historical questions requiring the investigation of evidence on a global, comparative, cross-cultural, or transnational scale. Manuscripts must be submitted electronically via the new web portal (jwh.msubmit.net); emailed and mailed article submissions are no longer accepted. Please create an account at this web portal, login, and follow instructions.